Whether you already have an image in mind of how you want your home to look, or if your design scheme is a blank slate, Lighting magazine is the perfect place to find your inspiration. Produced by Better Homes & Gardens, Lighting Magazine is full of pictures of beautiful home settings featuring the latest lighting and design trends, including before and after remodeling shots. Visit a Hortons Home Lighting Showroom for expert lighting advice. Try these simple tips to instantly get more style power and energy savings and from your lighting. Elk LightingLampshades have a lot of design power for a very low cost. A new shade, perhaps with a punch of color or modern fabric can give new life to your space. Light colored shades help to diffuse light in a wider circle, while dark shades concentrate light onto a surface. Spaces designed primarily for watching TV need less overhead and more ambient and task lighting, such as lamps, to reduce glare. 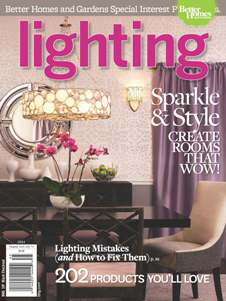 To read more tips to improve your lighting, check out the new issue of Lighting Magazine. The magazine hits newsstands in April. To get a complimentary copy, just click here. Photo above courtesy of Elk Lighting. Ask a Hortons Home Lighting Professional to show you the best fixtures for your home. I’m remodeling a bathroom and am placing sconces on either side of the mirror. Many of the newer fixtures use fluorescent or LED bulbs. Are these acceptable types of lighting for a vanity? Both fluorescent and LED light sources are very appropriate for vanity lighting and are available in a variety of color temperature options. You need to use either 2700K or 3000K to simulate the look of incandescent lighting. You also need to select a fixture with a light source that has a Color Rendering Index of 80 or higher. Also, it is always good practice to see the fixture turned on before making a buying decision, so you can evaluate the color.